Today we went to the ceremony down at John Hancock hall in Boston for Zach winning a silver key for a jewelry piece in the Boston Globe Scholastic Art Awards, a regional competition. Apparently, the awards were established in 1923 and involve over 6000 students and over 10,000 pieces of art. Each student had to go up on stage and say something like, “Hi, I’m Zach Reckling and I won a silver key for a jewelry piece. I go to Brookline High School.” It was kind of like an affirmation of the work they do. Teacher’s could submit up to 15 pieces from each school, so he actually had to get by that criteria first. Zach got a silver key for this piece of jewelry he made at school. It’s on display at the Transportation Building in downtown Boston. We went over there to check it out, which is where I got cooperation for the above picture. He also got an honorable mention for a print, pictured below. And here he is on stage, following “in the footsteps of the masters”. Afterwards we walked over to see the exhibit at the transportation building, then back over to Cheesecake Factory to stuff ourselves. I met up with Adam briefly (so much music going on!) where he was hanging out with 3 of the nice instruments they made. 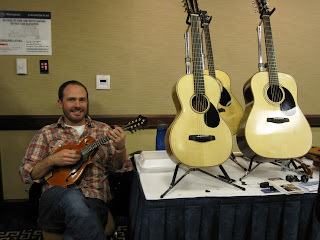 I got a chance to try the little parlor guitar on the left – so loud, even with all those banjos playing in the same room. You can catch pictures of this and other guitars being made here: http://vermontinstruments.tumblr.com/ including a picture of Marc Ribot with the parlor (I think) and Jorma with the tenor guitar on this page. More pics of the tenor guitars and parlor are here. Neko Case apparently has one of them in hand now. Good to see Adam – I must make a road trip up to Vermont (maybe wait for summer, though).